Mac N’ Cheese? Hot Chocolate? Eggnog? Popcorn? Chips? Whatever it is, you can make it healthy. There is literally an alternative to EVERYTHING. (Believe me I have looked ;)) Experiment by making your favourite dishes and yummy treats using alternative, whole-food ingredients like dates, pumpkin, oats, nut milks, nuts and seeds, raw cacao, etc. Real food ingredients trump packaged processed foods any day. Check out my recipes page for some ideas! Find people who are serious about their health or who want to commit to a healthier lifestyle. Having a buddy with you on this journey is so important. 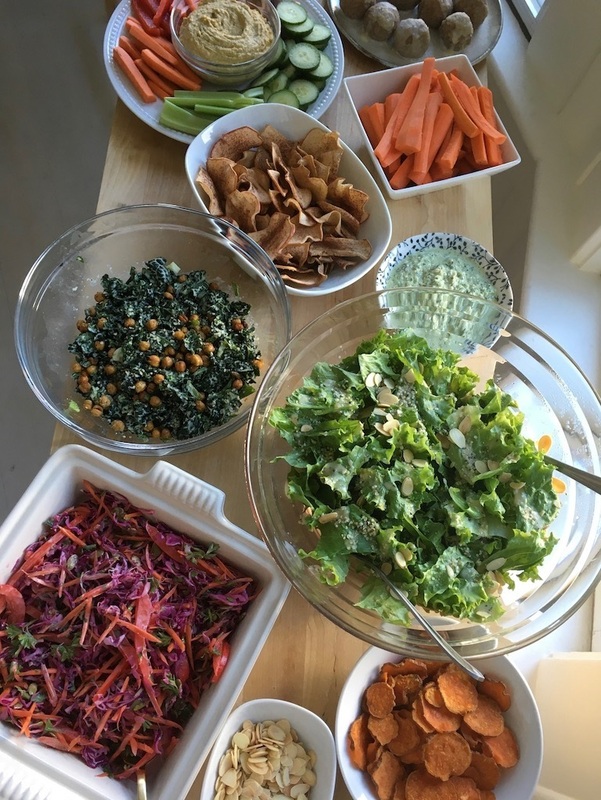 You can attend your own events, and create your own potlucks and recipes together that you can all eat and that won’t leave you feeling crappy, AND that are just as delicious! This doesn’t take away from being social and you can actually eat all of the food without compromising your health. Because why should we have to choose? Win-win. If you don’t have anyone in your circle who is willing to change with you, find new people! There are no excuses nowadays to meet new people with all of the resources we have; facebook groups, meetups, events, or simply through social media like instagram or twitter! If you know there is only going to be junk food at the party or food that you can’t eat then you must be prepared. Because no one wants to be hangry and frustrated by the limited food options available. Have a protein rich snack or a balanced meal beforehand with lots of veggies, good fats, and protein so you stabilize your blood sugar and don’t feel tempted by all the junk. This will avoid over indulging and make it easier to skip the excess calories. You’ve eaten healthy all day but now there’s that chocolate cake staring back at you. If you really want that piece of cake, have it. But only if you enjoy it fully. Experience each bite and take your time. Allow yourself to enjoy it. If you feel guilt, you’re more likely to shove it down your throat and want more and more. One piece of cake isn’t going to make you gain weight, just like that one salad won’t make you skinny. And eating in a stressed state is probably going to create more damage to the body than that piece of cake. On the other hand if you know you should not eat it, think about how you will feel if you ate it; will you feel better or lousier? Will it be worth it? Make your decision based on projecting yourself into the future. Staying hydrated is not only important for all functions in the body, it can also help you make better decisions! When most of us feel cravings or hunger we are actually thirsty. And instead of reaching for the water, we tend to reach for the sugary or salty snacks, which just leads to more cravings. Make sure you are drinking more water than you think you need throughout the day. Aim for 2-3L per day or divide your body weight (in pounds) by 2 to get your ideal number of ounces per day. Increase if you are very active. I always preach my veggies but even more so during the holiday season. We tend to lack nutrition during the festivities which can lead to weight gain, cravings, poor digestion, fatigue, and low mood. Vegetables are an important source of many nutrients, as well as fiber. This keeps you full for longer, stabilizes your blood sugar, and promotes healthy bowel movements. During any meal make it a habit of crowding at least half of your plate with non-starchy vegetables like broccoli, leafy greens, zucchini, cauliflower, asparagus, carrots…. This will make you feel satisfied a lot quicker and help you avoid that food coma ;). We tend to get overwhelmed during the holidays, planning everything to the last detail and becoming overwhelmed with everything we need to do. But what if we just took a moment to enjoy the moment? Instead of thinking of the next diet you’re going to start after polishing off the donut in your hand and how you’re going to spend an hour on the treadmill when you get home, why not just focus on what’s going on right now? The holiday season is going to fly by, might as well enjoy AND remember it right? Studies have shown that lack of sleep disregulates our hunger hormones. Explains a lot right? When you are sleep deprived (this usually looks like less than 7 hours per night) your hunger hormone ghrelin actually elevates and your satiety hormone leptin lowers. Which means? You feel hungrier and experience more cravings when you don’t get enough sleep. Plus your brain isn’t receiving the normal feedback it should be getting when you have had enough to eat, which makes you eat more than you should. Make sure you are getting 7-9 hours every night, the earlier the better! Get moving everyday! The benefits of exercise are endless but as we tend to indulge in more sugary and carb heavy treats during this time of year it’s even more important. Exercise helps to regulate blood sugar, improve heart health, and improves energy and mood. Whether it be a quick jog, weight lifting, walk to work, or a workout class, schedule it in each day so you’re sure to commit! If you know you are going to reach for the cake with dairy that you don’t usually eat or you always feel bloated after Christmas dinner, then be prepared! Bring digestive enzymes with you so you can reduce any symptoms and promote better digestion. I always keep a bottle in my bag just in case. Pick a smaller plate when you’re at the buffet to gage your hunger more accurately, get up to walk around the room at least once an hour, refill your glass of water every time you get up, eat twice as many veggies…. There are definitely some better options you can make whether you’re at a NYE party, restaurant, Christmas dinner, staff holiday party or the local bar. For alcohol, choose red wine or a vodka tonic with lemon or lime and avoid the sugar heavy drinks like beer and juice cocktails. For every alcoholic beverage, drink at least double the amount of water. Instead of the heavy gravy and creamy dishes choose the steamed, grilled, or sautéed dishes and always opt for more vegetables. For starters; veggies and hummus, tortillas with guacamole or salsa, and olives are great options. We tend to neglect our digestion during this time and also experience consequences like bloating, gas, and indigestion. Some ways around this? Portion! Make sure you are eating until you are 80% full. Stuffing yourself is only going to put a strain on your digestive organs resulting in undigested food and a lot more work on your entire system, not to mention that dreaded food coma. Start your day with a warm lemon water with ginger, this will help flush out the liver and kickstart your digestive process as well as relieve any tummy upset. If you feel like you ate something that doesn’t sit well with you or feel bloated, take 1-2 charcoal capsules to help get rid of any toxins or unwanted food. Does eating out with PCOS stress you out?